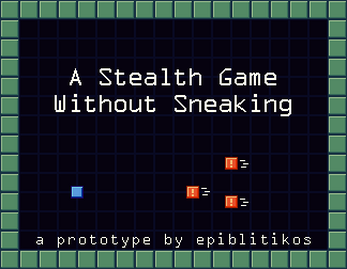 This is a stealth game where you can't sneak. In fact your movement always makes noise. Based on an idea by my friend Adam for GMTK Jam 2018 (Genre without Mechanic). Use WASD keys to move. As you walk, you make sound (visualized by the circles). If an enemy hears you, they track to the sound, and if they see you they give chase. Get the key and escape through the door without getting caught. The enemies see in 360 degrees, but not through walls. Their vision has a distance limit on it though (and the AI is a bit dumb yet *wink wink*). There's just the one level. Let me know how you like the idea! I'm pretty happy with it so far, but I'm looking for feedback before I go all in on it.